We no longer accept articles for our 2019 April issue. Unfortunately, we do not accept articles in the following fields for the mentioned issues since they are full for 2019. Thank you very much for your interest. Publication time in our journal varies between 6 months and a year depending on the busyness of the sections. We receive papers from Literature, Communication, and Economics and Finance sections excessively; therefore, it may take longer to publish one's papers in these fields. 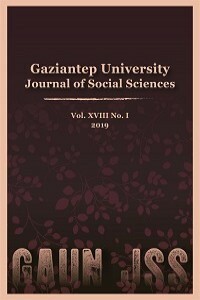 Gaziantep University Journal of Social Sciences (GAUN-JSS) is a double-blind peer-reviewed international academic journal published quarterly (in January, April, July and October). GAUN-JSS is published by the Institute of Social Sciences, Gaziantep University- one of the leading research universities in Turkey. GAUN JSS is an open access journal aiming at the free circulation and distribution of knowledge. The aim of the journal is to promote theoretical and research-oriented studies, to improve the quality of research and to encourage mutual sharing of national and international academic research. Although GAUN-JSS is a multi-disciplinary publication supported by academics, it also encourages the papers of researchers who are experts in their fields. The publication language of the journal is English and Turkish. However, studies in French are also accepted in the field of Law. A minimum of two peer reviewers, who are recognized specialists specific to the topic and area of the submissions, are appointed by the editor(s). All peer review reports are electronically and anonymously delivered to the contributors. Reviewers' names are withheld by the journal to protect the integrity of the double-blind peer review process. Upon request, written reports can be provided to the reviewer that attests to their contribution. All published authors accept to act as reviewers for future issues. Every work submitted to our journal is checked against potential plagiarism by the originality detection software: Turnitin and iThenticate. Any work that exceeds 20% is automatically rejected. The publisher guarantees open access to all academic work; therefore, they ensure that the published content is free and universally accessible. Therefore, the publisher does not charge any fee for the publication of the submitted articles. 1. Dear authors, if more than one author contributed to your work, please be careful when entering the names of the authors. The order of the authors is the order entered by the author (s) when the article is uploaded, and no changes can be made later. 2. Authors can publish only one article per year. If an article they sent is rejected, they may send another one for review.